Welcome to the second installment of my “Cold Cartography” series, a group of posts looking at the snow-covered Halo multiplayer maps and reflecting on their layout and lore. 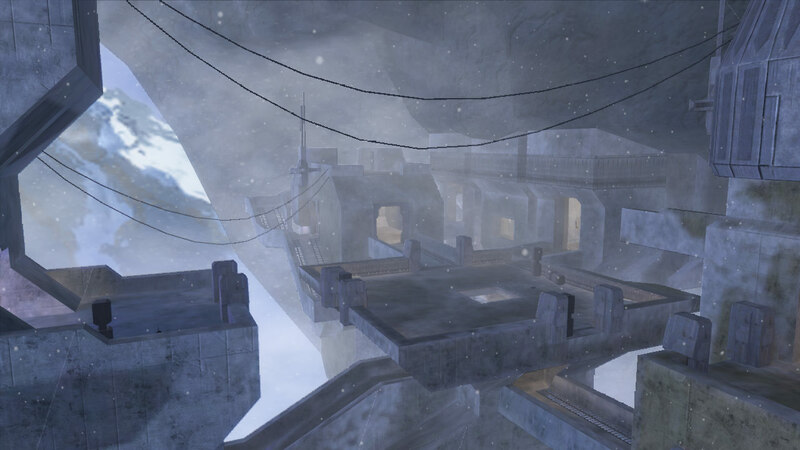 Tucked against a rock face on Delta Halo, Lockout was one of the standout maps of Halo 2. Originally set to feature in Halo: Combat Evolved*, Lockout was worth the wait as it kept players constantly on edge with its power positions not easily defended. Made up of three levels, the top saw the sniper and battle rife face off against each other while snow fell silent between. The central area was the vertical middle ground you crossed at your own peril – bullets (and exploding power cores!) usually coming from several angles as you tried to make it across. You were an easy target, but a few well-timed jumps in this area was the fastest way to cover the distance of the map. Shotgun acquired: engage enemy team and deal out justice! Shotgun unavailable: engage enemy team and receive justice! As you could guess I was extremely partial to the first option. Lockout also had several places where instead of meeting at a right angle the floor rose up to meet the wall at about a 45 degrees (or less), giving the player a chance to camp a doorway or other opening. I’m thinking particularly of the area right underneath the middle square, where having just escaped the carnage above you would be finished off by someone who had probably entered the same room seconds before. Lockout not only holds many multiplayer memories, but some story elements that are worth pondering. Set on Installation 05 (the second Halo ring discovered by humanity, found orbiting the icy gas giant Substance in the Coelest System), the space appears to be an ancient Forerunner lab and/or base that was used to study the Flood. No doubt the location’s subzero temperatures played a part in the decision to build there. There are several questions that Lockout doesn’t answer, but prompts use to ask. Was this structure ever overrun by Flood? We know 05-2401 Penitent Tangent was derelict in his duties. The area isn’t covered in Flood growth when we encounter it, but could have been after. If this was the case, than it may also have been glassed by the Covenant Separatists (to prevent the Flood from spreading) after the events of Halo 2. And what of the UNSC base now at Delta Halo? (It was mentioned on the level “Infinity” by Laskey in Halo 4.) If Lockout wasn’t glassed, has ONI or any other branch of the military discovered it? We visited the research facility (Ivanoff Station) above Installation 03 in Halo 4, could we see a plausible canonical reason to revisit Lockout in subsequent Halo games? Possibilities like this are why it matters that these multiplayer maps are wrapped in fiction – it allows the connection of stories and settings in ways you wouldn’t have open otherwise. What about you? Any fond (or not so fond) memories of this chilled map on Delta Halo? Have any theories of your own on the fiction of the location and what it could mean? I’d love to hear them – feel free to leave a comment below. Thanks! Lockout was originally named “The Cage” and was intended to be released with Halo: Combat Evolved. However, it didn’t make the cut and instead made its debut in Halo 2, albeit with some significant changes since initial development. The original version of The Cage appears in Halo: Reach as a Forge World map variant shipped with the game. Very interesting article. I never got to play Lockout on LIVE. Nice article. Lockout will always be one of the best, and I’m sure for many it’s THE best. Interesting point about a possible campaign return to Lockout. I think it could be in Spartan Ops if it’s in Halo 5/6. Unlikely, but we can dream. Great to see you Gun. It would be pretty crazy/great for them to some how work Lockout into the story proper, and with at least two more games coming down the line anything’s possible. Glad you like the new look! The top banner really sets it off, and I have to thank Hemlax over at Stosedemnast for that.